The House just unanimously passed a bill allowing federal workers to get back pay. The Senate and President are in support so this should soon be law. This measure was not controversial. Even Congress realizes that they, not the Federal workers, are the reason these people are not working and Congress, not the workers, is the problem. While they are getting paid without working (government efficiency?) that workers should miss car payments, house payments, and be unable to pay other crucial expenses while Congress figures stuff out is a hard position to defend. However, in doing so, they may have un-wittingly removed the legal justification for the shutdown itself. Modern government shutdowns date back to the Carter administration’s interpretation of the, at the time obscure antideficiency act (for an overview of the history see here or here). In short, government cannot enter into a contract without funding – so workers cannot work with the expectation that Congress will fund them (even though they probably will). Now with the passage of a bill to guarantee backpay (here), workers would no longer be working with a hope that Congress might or expectation that Congress will fund, but instead a legislative guarantee. A lawyer may need to take a closer look, but from this layman’s eyes it is time for Federal workers to go back to work, and they don’t need a dysfunctional Congress to agree first. Perhaps in this case two wrongs of Congressional dysfunction have made a right? The Deficit: It’s the Economy, Stupid! America’s approaching debt crisis is the topic de jour, both in the news room and in the living room. We have the fiscal cliff, the battle of the debt ceiling (parts I, II and soon to be III), the sequester, fiscal commissions, etc. We are shown scary charts, and told (truthfully) that the federal government is running another trillion dollar deficit and borrows 46 cents of every $1 it spends. However, what we do not see is a careful examination of what is driving these deficits, and what that means for our future and our policy choices. In this, my first series of post, I will drive to do just that with simple charts from freely available data sources. We see a small spike in expenditures during the recession, but they then go flat. The revenue side is more dynamic. 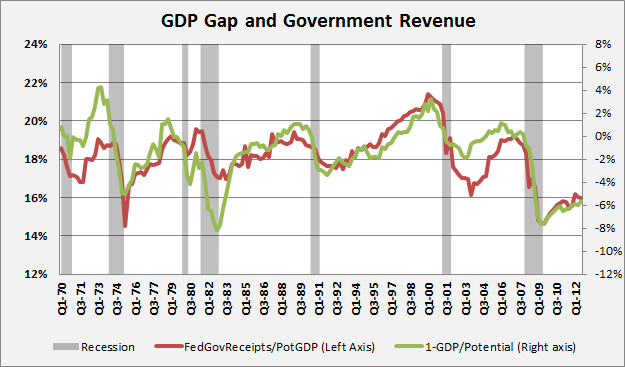 Federal government revenues drop precipitously (17.4% from peak to trough). In fact, in purely nominal terms (not adjusting for inflation or population) they did not pass the pre-recession peak set in Q2 2005 until Q1 2012 – nearly 5 years! From 1992-2007 government revenues grow about 1.38% per quarter and expenditures grew at 1.18%. If numbers held over the six quarters of the recession we would expect expenditures to grow by 7.3% and revenue to grow by 8.5%. Instead revenue fell by 16.4% (25% below the pre-recession trend! ), and expenditures grew by 18.9% (11.6% off of trend). The point of these charts and data points is to demonstrate that the budget deficit is mainly driven by the very severe recession, from which we still have not fully recovered. But one final chart to drive home this point. Revenues actually vary pretty consistently with drops in unemployment, and along with that potential GDP. 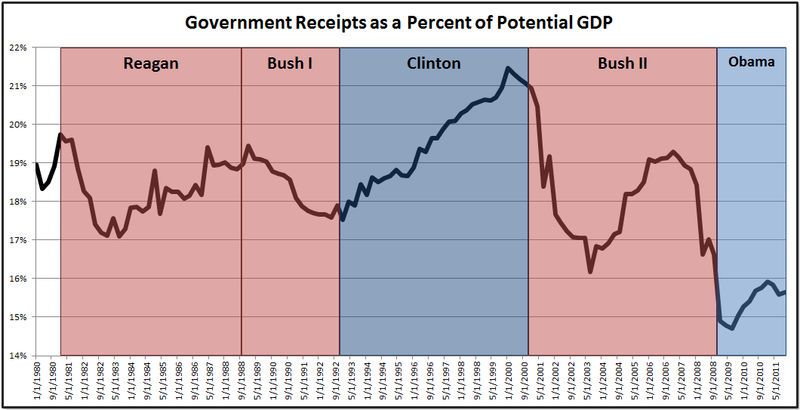 When controlling for the GDP gap, the deficit we are facing is not an outlier . What is abnormal is the size, and duration of this drop in employment and GDP. 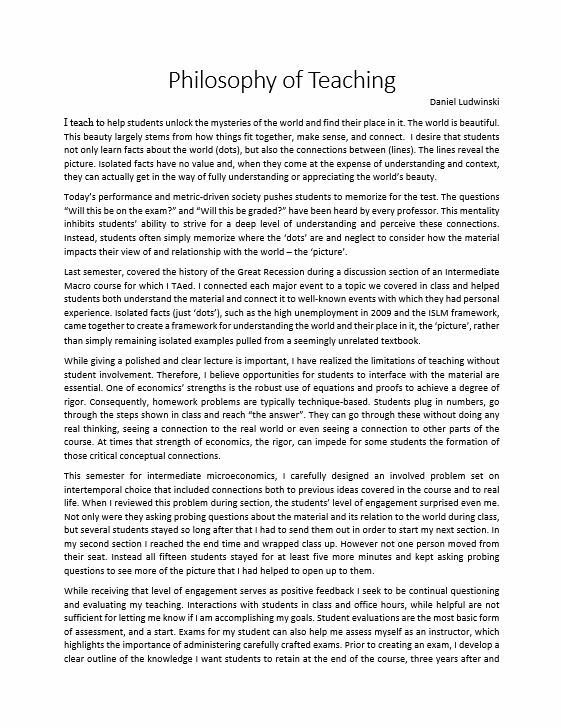 This is what we should be discussing! (And, in future post, hopefully I will). All the data was obtained using Federal Reserve Bank of St. Louis’s excellent excel plug-in: http://research.stlouisfed.org/fred-addin/install_windows.html. Here are the exact series and calculations for each chart. In parentheses are the FRED series IDs. 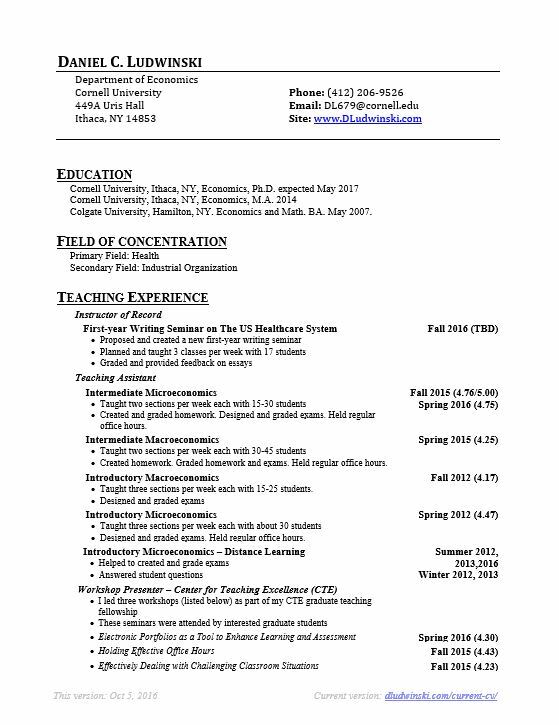 Corrections and concerns appreciated! 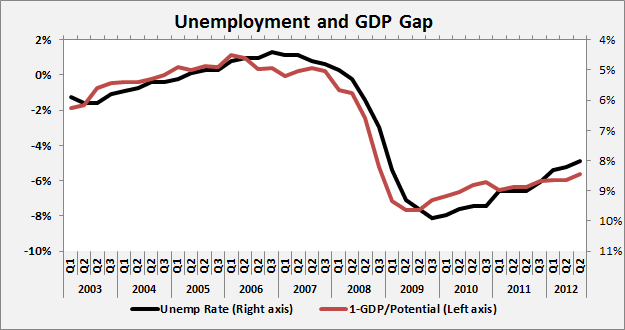 2b: GDP Gap. 1 – ( [Nominal Gross Domestic Product] (GDP) ) / ( [Nominal Potential Gross Domestic Product] (NGDPPOT) ). Both from the U.S. Department of Commerce: Bureau of Economic Analysis. 3: GDP Gap. 1 – ( [Nominal Gross Domestic Product] (GDP) ) / ( [Nominal Potential Gross Domestic Product] (NGDPPOT) ). Both from the U.S. Department of Commerce: Bureau of Economic Analysis. 4: Nominal GDP. [Nominal Gross Domestic Product] (GDP). From the U.S. Department of Commerce: Bureau of Economic Analysis. 7b: GDP Gap. 1 – ( [Nominal Gross Domestic Product] (GDP) ) / ( [Nominal Potential Gross Domestic Product] (NGDPPOT) ). Both from the U.S. Department of Commerce: Bureau of Economic Analysis. In Colombia I was able to purchase an iPhone SIM card for 7 pesos (~$5), got great reception and data that lasted a week with no contract and I could refill it whenever and wherever I wanted. Here in the U.S. I pay Verizon >$100 per month for the same service on a 2 year contract. Discuss. Since I’m not teaching this semester, I’ve really missed the fun, illustrative graphs that can get at the heart of a question. First, the set of disclaimers. I have no special expertise in the complicated field of cell phones. This is a gross simplification, and probably wrong in a bunch of ways. I did not spend the time to actually look at data points such as regulations, market concentration, comparative consumer buying power, etc. In the cell phone market, the biggest cost are no doubt fixed. The fixed cost of laying down physical communication lines, building towers, buying/leasing wireless spectrum cost a lot more than the marginal, per-user/megabyte cost, which in small quantities is near zero. Also, irrespective of the regulation regime, it is very difficult to have a very competitive market. Cellular providers are close to what is called a natural monopoly. This means that once fixed cost are covered, the price that is charged is determined mainly by two things: the composition of the demand curve and the ability of the telecom companies to price discriminate. I apologize for the crudeness of these charts and this analysis, but I think it actually gets pretty far. We start with the two demand curves. The higher disposable income in the US is reflected by the higher demand curve (willing to pay more at any quantity). 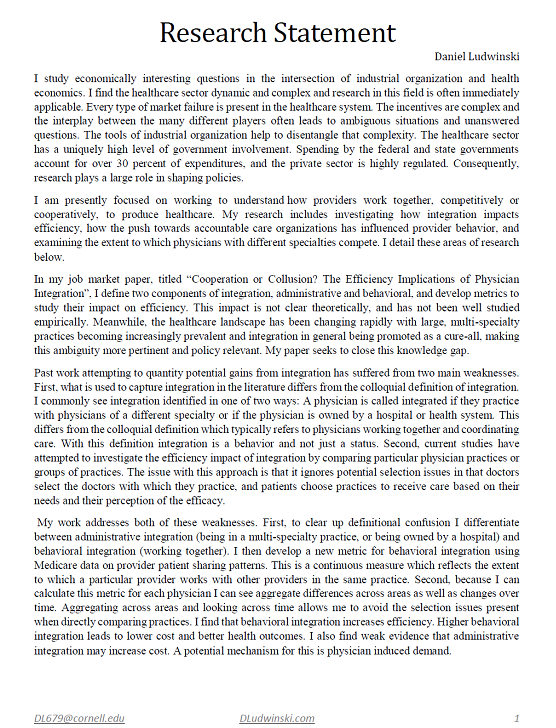 We then put in the marginal cost curves, which for simplicity I’ve kept low, constant and the same across the two countries. The marginal revenue curve is the extra revenue the monopolist sees by lowering the price and selling another plan. Because the monopolists are not price discriminating in this example, it is a simple downward sloping curve. A profit maximizing monopolist will sell at the point where MR=MC. While the quantity that this happens at is not very different across the countries (looks to be near 40% in this totally made up example), due to the different in the demand curves the price that reaches the profit maximizing quantity is actually very different. So what this very simple analysis tells us, is ignoring any differences in regulations, market structure, population density, etc, a lot of the variation in prices could potentially be explained simply by the differences in consumer disposable income across countries. My time constraints mean this needs to be brief, but I think one of the strongest arguments for a strong social safety net comes directly from free-market economics. Let me explain. In last night’s snoozer of a presidential foreign policy both candidates argued that they would be better able to project American jobs from foreign competition. Obama in particular pointed to tire tariffs on China as a major success. But these tariffs are an economic disaster that the American consumer is paying for (see http://www.washingtonpost.com/blogs/ezra-klein/wp/2012/10/23/how-obamas-tire-tariffs-have-hurt-consumers/). A very conservative estimate says that each job has cost consumers nearly $100,000 a year. There is no unified lobby for the American consumer. When we all take small hits, it gets ignored. Instead of pursuing really bad economic trade policy that cost the American consumer loads of money to save a couple of jobs, we would be much better off pursuing free trade, helping the world specialize and grow. By lowering the cost of job loss, a strong social safety net can free us up to pursue good policies at a cheaper end cost to consumers. There is a true pareto improvement to be had here. Sadly, this is a case of the all-to-often true: when the political parties agree, they usually are both wrong. George W pursued similar policies in the steal industry, with will documented massive cost to the American consumer and economy. The Romney/Ryan tax plan calls for lower tax rates. They argue that the plan is going to be at least close to revenue neutral due to some unspecified base broadening. I’ll leave that as stated. My question is, if this is such a good idea, why not pursue the same sort of base broadening plan with Social Security/Medicare. Combined FICA taxes are 15.3% when you include both employer and employee contributions (and ignore the temporary payroll tax decrease). In 2010, this generated $781.1B in revenue (2011 report). The big catch with these taxes are they are regressive. Dollar earned beyond $108,000 are not taxed. If we broadened the base (taxed those earnings) we could substantially lower the rate. A quick calculation: if we just stuck to wages we could lower the rate to 9.83% (based on BEA compensation data). If we widened it to include non-wage income (i.e. capital gains) the rate could be dropped all the way down to 6.02% (based on BEA personal income data). It would seem that this proposal would appeal to the Romney/Ryan idea of broadening the base and lowering the tax rate, while appealing to the Democratic idea of soaking the rich. Why then is it not even being discussed? Note: The reason it historically has not been discussed is SS/Medicare was not supposed to be a “entitlement”. It was a designed as pay in / pay out system, where benefits were not means-tested and contributions were not regressive. I think since we’ve been calling them entitlement programs, and thinking about them as such for quite some time we should make the move to structure them that way. Excluding Medicare, the current tax rate is 12.4% (combined employee and employer). The rates with the broader base are the same at 9.8% and 6.0% – and the tax reductions for each would be 2.6% or 6.4%. For the median worker ($50,054 p31), these two plans represent increases of $3,200 and $1,275 respectively. To put this in perspective, between 1967 and today (45 years) median income rose about $8,000. Yesterday, for the first time, I spent more than $50 to fill my tank of gas. I do not have a particularly big car (it’s a Subaru Legacy), but a combination of a very empty tank and more expensive gas than usual (was $0.13 cheaper this morning, burn!) caused my to set the record. The president and Detroit recently agreed to raise the fuel economy standards. Eduardo Porter has a great piece in the New York Times demonstrating why this is a poor strategy. If we want less of something (gas usage) we need to make that more expensive (tax it). in Britain, where gas and diesel are taxed at $3.95 a gallon, the American automaker Ford sells a compact Fiesta model that will go nearly 72 miles on a gallon. 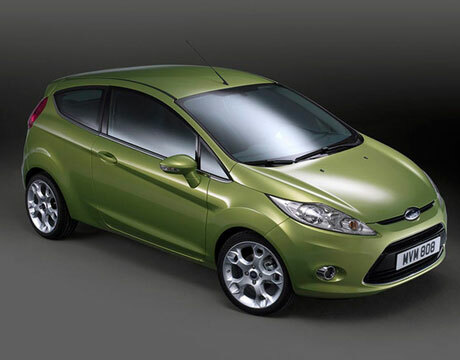 In the United States, where gas taxes average 49 cents, Ford’s Fiestas will carry you only 33 miles on a gallon of gas. The truth of the matter is the federal governments revenues are at historical lows. In fact, looking back as far as the FRED data source goes (1950s) we have never had such a long time where revenues have remained under 16% (excel data here). The truth of the matter is that in order to restore fiscal health, revenues (i.e. taxes) have to go up. Granted a lot of the drop in revenue has to do with the recession – less people working and earning less money means less income. You can clearly see the recessions and booms effecting receipts. While raising taxes in this economic climate may not be the soundest policy, long term even Paul Ryan agrees that we need more revenue. He and Romney just like keep it vague by saying that they will “broaden the base” instead of going out there and saying that taxes may actually need to return to the Reagan rates to restore fiscal health. 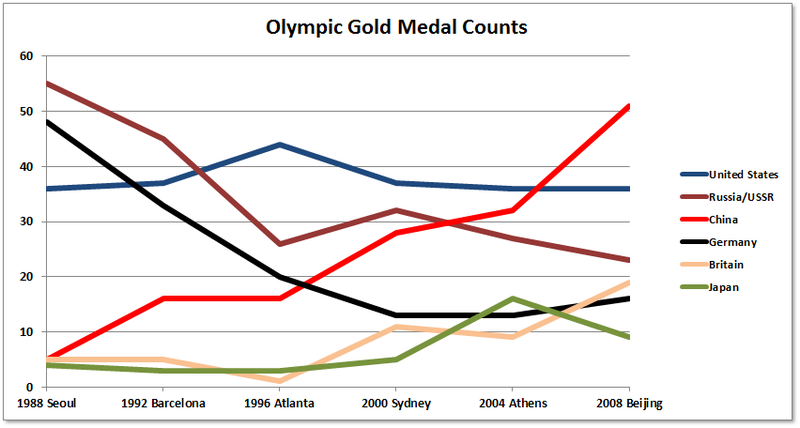 I’ve updated the charts below to include the results from the just completely London 2012 games. This was a very good Olympics for the USA. Ignoring the boycotted games of 1984, and the barely attended games of 1904, this was the most Olympic gold metals the United States had ever brought home. This is significant achievement in an era where the global economy is (happily) starting to catch up. In 1999, the US hit a post-1970 peak of 28.4% of world GDP and by 2011 this had fallen steadily to a post-1970 low of 25.5% (post 1970 because the easiest data source, USDA, only went back that far). FYI, those 46 gold medals only represent 15% of the total 302 gold medals awarded, so maybe we’re punching below our weight in terms of GDP. While much has been made of the achievements of the British team (which I do not want to diminish), their leap from 2004 to 2008 was actually more significant. Team GB went from 9 gold medals in Athens to 19 in Beijing – more than double. They added another 10 this year, for 19 total, but that was just over a 50% increase – substantial, but not as dramatic as four years ago. After a lot of early disappointment, Russia actually improved their gold medal haul over Beijing. After a slight improvement in Beijing, Germany hit a new post-boycott low. China dropped off significantly from when they hosted, showing more evidence of a home-field advantage effect. NPR had an interesting piece discussing how this effect comes into play (thanks to my brother-in-law for pointing me to that). Ignoring last year’s bump, China’s trend line shows a pretty steady climb. This sets up a pretty good battle for supremacy in Rio four years from now. However, regardless of who is expected to win, I think we all will be rooting for NBC to broadcast the games live this time! I often hear a lot of people complain about politicians buying votes – outspending their opponents to win elections. This pisses me off. 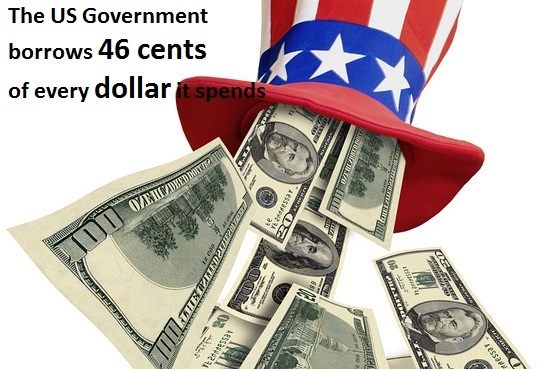 Not the fact that politicians spend this money. Not the amount that is spent (which is famously, less than we spend on potato chips). What bothers me is the naivete present in that phrase: “buying votes”. I do not think they are using that phrase to mean that a transfer of money to voters is happening conditional on a vote. This happens frequently in other countries, and it diminishes the global struggle for democracy to call what goes on here “buying votes”. What money typically buys in US elections is eyes and ears. It pays for TV ads, campaign mailers, door-to-door campaigns. Money is used to disseminate positive information about the candidate, and negative information about the opponent. However, this information is only effective to uninformed voters. For those who have done their research, a flyer with a positive spin on a candidates record is not going to add much. For informed citizens, attacks reflect negatively on the candidate especially when they stretch the truth. The fact that spending money on campaigns is so effective is not an indictment of the political process, or politicians. It is a rebuke of an American public that is more interested in watching project runway than being informed citizens. A representative democracy allows us the luxury of only having to cast a federal vote every two years. We do not have to know about every bill and every issue. But do the research, be informed, and vote according to what you believe. The only way to take money out of politics is to minimize its effectiveness. I put this chart together because after reading this BBC article I was interested in seeing the visual. Apart from the well known and discussed rise in China, and the fall in both Russia and Germany, what strikes me is the truly remark consistency of the US gold medal count. Aside from the 1996 Atlanta Olympics (with the home field advantage boost), since 1988 the US has received either 36 or 37 medals. Going back further, in 76 and 72 Team US had 34 and 33 medals respectively (I skipped 1984 and 1980 due to the boycotts). Notes: Germany includes both East and West. Russia includes the unified team for 1992. 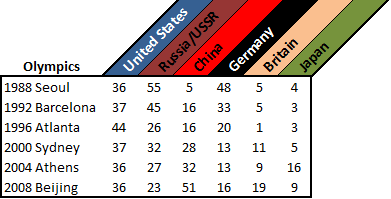 UPDATE: I took a look at the full historical medal counts for the US. This consistency is not new! 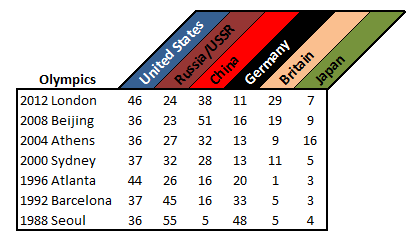 While there are obvious outliers – 1896 first olympics, 1904 the US was the only team in half the events, 1980/1984 boycotts (which I excluded in the trend) – it is extraordinary how much in the world has changed over the 112 years, yet Team USA pulls in about 36 golds in the summer games. Also, the outliers balance themselves out: average including them 36.58, average excluding them 35.41.